Chickpeas, also known as garbanzo beans, are an ancient crop that has been grown in India, Africa, the Middle East and India. They are second to soybeans as the world’s most widely grown legume and have both health and beauty benefits for you to take advantage of. Chickpeas are prized on their high manganese content, but they contain numerous vitamins and minerals. The seed coating and inner portion contains several phytonutrients with the outer coating full of flavonoids like kaempferol, myricetin and quercetin. The interior of the beans are rich in chlorogenic acid, caffeic acid, ferulic acid, and even vanillic acid. All of the phytonutrients function as antioxidants along with having anti-inflammatory properties. They are a very good source of folate, copper, fiber, phosphorus, protein, iron, and zinc. While you may not think to use chickpeas for hair care, chickpeas really should not be overlooked as part of your whole health diet. For stronger hair - The power of the protein in chickpeas and the excellent source of manganese help to strengthen hair. For longer hair - Manganese is a mineral element that acts like an antioxidant and a deficiency in manganese can lead to slowed hair growth. Chickpeas have a high amount of folate and folate plays an important role in hair growth by renewing the cells that aid in hair growth. To stop graying hair - Manganese also helps to fight against your hair changing pigmentation or graying and many women have been gravitating to manganese rich foods for that very reason. This is another vitamin great for stopping premature hair graying but also offers help in adding shine to strands, a common complaint for those with graying hair. For dandruff - The good source of protein also helps strengthen the hair’s cuticle. The vitamin A and zinc work together to prevent dandruff and hair loss. For dandruff, just mix 6 tbsp. of chickpea flour with water before massaging into scalp. Apply gently, ensuring to not scratch with your nails and cause potential damage. Let it sit in your scalp for several minutes before rinsing. For thinning hair - The zinc also helps in cell growth and repair and a deficiency in zinc can result in weaker or thinning hair. 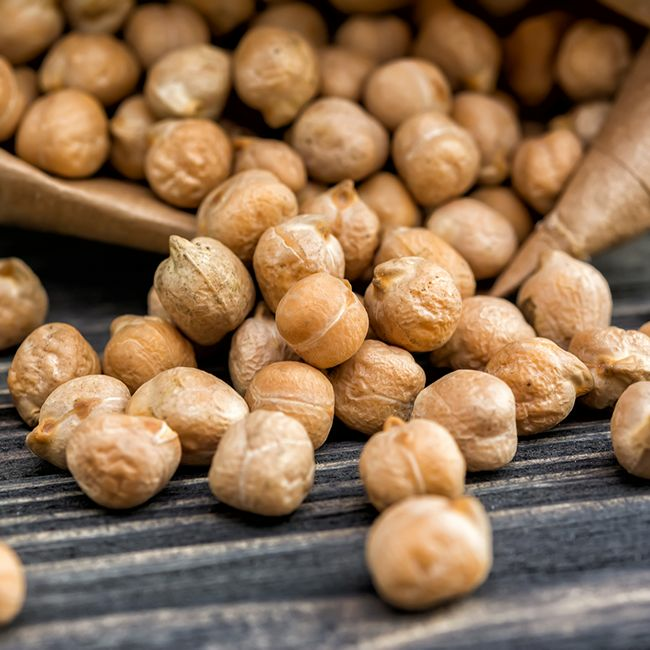 The copper in chickpeas is great for persons trying to regrow hair that has been killed off by chemotherapy as it is trying to kill of the cancerous cells and leads to hair loss. For an irritated scalp - The anti-inflammatory properties in the copper help to treat an irritable scalp and potentially reverse graying hair. For stronger strands and to reverse graying hair, chickpeas is a diet must.